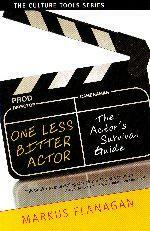 An invaluable reference for anyone who is a working actor, or wants to be. Learn how to make it in the day-to-day business of acting and stay sane and focused while attempting to merge art and commerce. This book covers everything the author wishes someone had told him about how casting decisions are made, what rejection really means, how to behave on a set, the two factors the business is built on, and much more. Markus Flanagan offers encouraging, highly useful pointers on such vital matters as: How do you combat getting typed?, Understanding the people you are auditioning for, Bad habits to avoid in the audition waiting room, The two deadliest questions you may be asked before starting your reading, What are they looking for in the call back?. One Less Bitter Actor offers sage, pragmatic, anxiety-calming advice on how to succeed in acting from one who has.